Web apps are an essential part of most people’s workflow, whether it’s writing an email in Gmail or editing a spreadsheet in Excel Online. It’s handy to have all your stuff in the cloud, for sure, but it’s kind of a hassle to have to open your browser and navigate to each website you use individually. If you’re running Windows 7 or Windows 8, you can make web apps feel more desktop-like by pinning them to your taskbar. You may not necessarily get features like offline functionality or local file system access—that’s up to your browser—but when it’s on the taskbar, your web app is always one click away. Pinned web apps also open in their own window, just like traditional desktop software. Right now, you can use either Internet Explorer or Google’s Chrome to pin websites to your taskbar. Both browsers aren’t created equally, however, and there are some differences in functionality depending on which browser you choose. 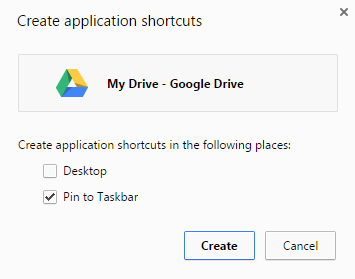 Chrome places application shortcuts on the taskbar by default. You’ll see a pop-up window appear that gives you the choice of creating your shortcut on the desktop and/or pinning it to the taskbar. By default your app is pinned to the taskbar, so press Create and you’re ready to go. If Chrome is your browser of choice then this is the method you’ll probably want to follow, but Chrome’s functionality isn’t perfect. 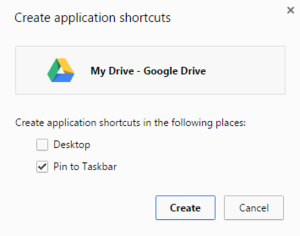 Pinned websites in Chrome don’t allow multiple tabs, for example—meaning every time you open a saved document or start a new one it opens in a new window. You may feel that the behavior gives the web apps a more desktop-like feel, however—separate Word docs open in their own windows, after all. To create a pinned website in IE, wait until the site has loaded, then click-and-drag the favicon (the site’s icon) from the address bar to the taskbar. That’s it! Your favorite web app is now ready to go. 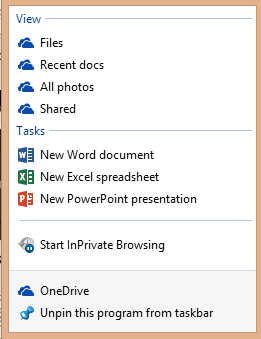 OneDrive’s Jump List in Internet Explorer. Some web apps, especially Microsoft ones, will support IE’s jump lists feature. Jump lists are links to specific features inside the web app. Jump Lists in OneDrive, for example, let you open jump to specific folders or start a new document in any of the Office Online web apps. To use Jump Lists, right-click on the pinned site’s icon in your taskbar. Jump Lists will work even when the window is closed. Internet Explorer also supports multiple tabs for pinned sites meaning you won’t have new windows open every time you want to start a new document in OneDrive. Thanks to that enhanced functionality, you might consider using IE for your pinned websites, even if you don’t like Internet Explorer in general—especially for Microsoft web apps like OneDrive and Outlook.com.